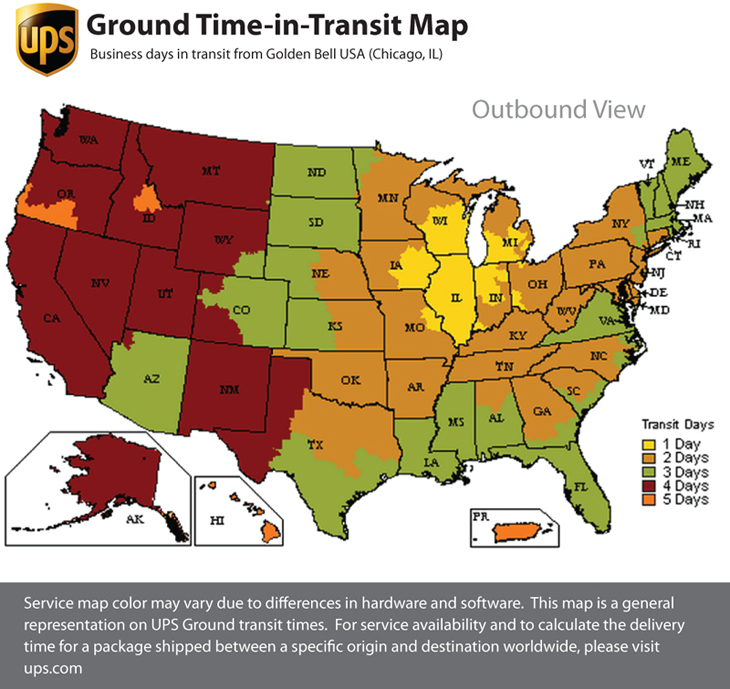 Estimated shipping and delivery times are displayed on UPS Ground Time Transit Map. After shipment delivery can take up to 7 business days depending on your location. While we make every effort to keep all listed merchandise in stock, occasionally we are sold out of a certain item. If we are out of stock on an item you have ordered, we will send you an e-mail update as quickly as possible. It will then be your choice to proceed and keep the order in place or cancel it. The back-order items that are charged will be refunded shortly. We ship via UPS and United States Postal Service (USPS). Shipping and processing charges for all items are based on the item size, weight, delivery destination, or other factors. Express delivery is available on some orders for an additional charge. To learn if your order can be express shipped, please contact customer service at 1-773878-3636. We will notify you of the additional costs before your order is shipped. When shipping to Canada, your order will arrive within these delivery estimates based on your location and selected shipping speed. To contact us directly for a shipping quote, please call 1-773-878-3636.
International shipping quotes do not include customs charges, duties, or brokerage fees or any other internationally related charges. You can update your unshipped orders by visiting My Order section in My Account and then clicking the Change quantities / cancel orders button. Go to Change quantities / cancel orders under My orders. Click on the order you want to modify or cancel. Most orders you place on GoldenBellUSA.com enter the shipping process very quickly so we can get your items to you as soon as possible. If your order has shipped; it cannot be modified. Your order will be shipped within 12 to 24 hours from the time you place your order. After your order has shipped, package(s) can be tracked on GoldenBellUSA.com. You can find tracking information in your order details. Go to Review orders / track packages under My orders. If you have concerns about your order, please contact Customer Service.